Credit: ©Art Wolfe / Art Wolfe Inc.
By genetically matching elephant tusks from large ivory seizures and comparing this information to details including the ivory's shipping port of export, researchers have exposed the three major exporters illegally smuggling the greatest amount of ivory out of Africa. Their work reveals how tusks from the same elephant are often shipped by the same trafficker in separate shipments. The researchers hope the data presented in their paper can lead to a more direct way to police this illegal trade, and further, that it can help strengthen ongoing cases against particular cartels by tying their operators to large ivory seizures. African elephant ivory trade has expanded into a multibillion industry that has led to the deaths of up to 40,000 elephants each year. In a 2015 study published in Science, Samuel Wasser et al. reported development of DNA-based tools for evaluating ivory tusks – tools that they used to identify the two major poaching hotspots in Africa. 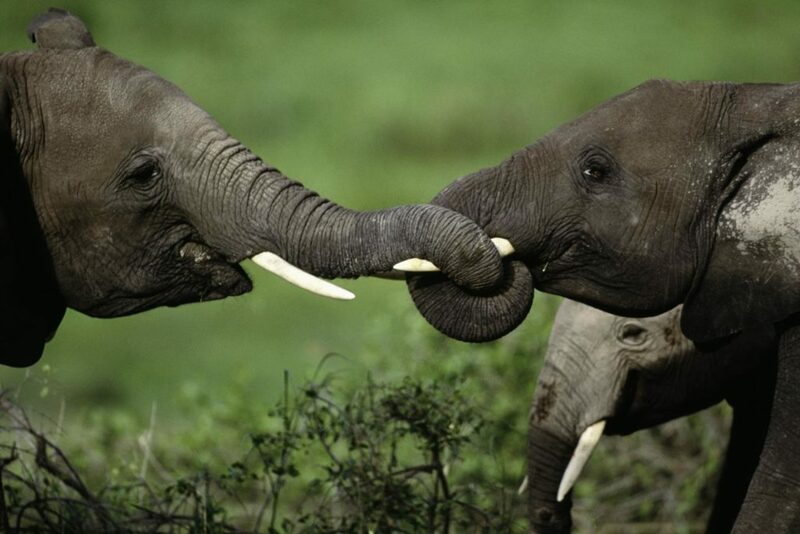 They hoped that this approach could play a role in helping stop ivory trade. However, even though poaching hotspots were few, the poachers in these locations remained hard to stop – in part because it's easy to ship contraband ivory after containerizing it and getting it into transit. Thus, Wasser sought a way to link individual shipments of ivory, otherwise hard to monitor, to individual trafficking cartels. He and colleagues used the same genetic approach previously published to understand the occurrence and patterns of genetically matched tusks. They sampled 38 seizures identified between 2006 to 2015, including bone samples from 10 elephants killed in a high-profile helicopter poaching event in Democratic Republic of the Congo. After genotyping the tusks, 26 of the samples from separate seizures were considered a match with a tusk in another seizure. Based on these genetic match-ups, and on additional information about the ports the tusks were exported from, as well as information on the tusks' geographic origins, the authors identified what they believe to be the three largest cartels moving ivory out of Africa during the peak 2011-2014 trade period. The authors say their findings also shed light on the sizes, interconnectedness and places of operation of these cartels.